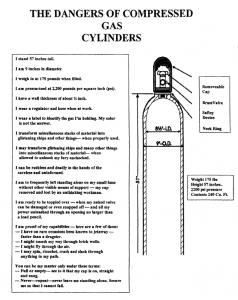 Dangers of Compressed Gas Cylinders Dangers of Compressed Gas Cylinders – click to see the above image as a document. More gas cylinder safety information is available from Pitt EH&S — http://www.ehs.pitt.edu/assets/docs/compress-gas.pdf it is part of the University Chemical Hygiene Plan — http://www.ehs.pitt.edu/workplace/toc.html. What type of Gas Cylinder should I use? What potentially hazardous gasses are restricted to order? Consult the EH&S Guideline for Health Hazard 3 and 4 gases (http://www.ehs.pitt.edu/assets/docs/health3-4-gas.pdf) to determine if the gas you want to obtain is restricted. Any gas listed as a HH3 or HH4 gas must be approved by EH&S in order to determine the allowable quantity that can be ordered for your laboratory. If you have any questions please check with Pitt EH&S (412) 624-9505. Are the cylinders that I typically purchase — Nitrogen, Argon, Helium, Oxygen — okay? If so, then I just need to check in with EH&S regarding the mixes or non-standard tanks. Yes, Argon, Helium, and Nitrogen are Inert gasses; Oxygen can be an Oxidizer. An example of a problem is Propane; as you know grills use this flammable gas. Propane is limited to one pound cylinders and EH&S should be consulted prior to ordering propane. Nitrogen dioxide is the toxic gas that a research group had problems receiving after ordering it, and so they just isolated as a reaction product for their needs. Chlorine is probably a nice example of a poisonous gas, as with poisons they say it’s the dose. In low quantities it is safe; we smell Chlorine at the swimming pool and have it in tap water. If you plan to order any of hazardous gasses please check with Pitt EH&S (412) 624-9505. Can I buy a Lecture Bottle?